It is summertime and one thing that means is simple meals and there is nothing better than salad. I try to keep either salad ingredients if not some sort of salad in my fridge at all times. 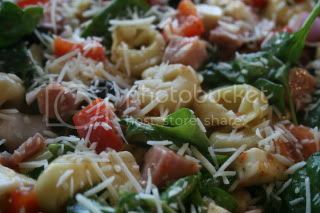 Pasta salads are a quick go to and are great for light filling meals. My Super Easy Pasta Salad definitely fits the bill. It has a great balance of pasta, meat, veggies and cheese. How can you go wrong when there is cheese involved? My Super Easy Pasta Salad is an extremely easy to make pasta salad. I cannot even begin to tell you how many times I have made it over the years. It is always a huge hit at potlucks and i’m always asked for the recipe. When I tell people the recipe they are always shocked at how easy and good this recipe is. Sure, you could make your own dressing but this recipe uses store bought for the easy factor. Make it for yourself and see how good it is! Combine all ingredients except salad dressing. Add enough dressing to coat. Somedays I use the whole bottle, others almost the whole bottle. >That was me:) The recipes for the pics were on the pics. They should be fluffy peanut butter frosting and extreme chocolate cake. I will say both recipe's were great and my son's teacher asked me for the recipe. This was another case of every kid eating their entire cupcake.